Birth day of Prophet PBUH and Imam Jafar Sadeq AS, unity week and victory day of Islamic revolution celebration ceremonies on their best was held in Imam Hussein AS Mosque. 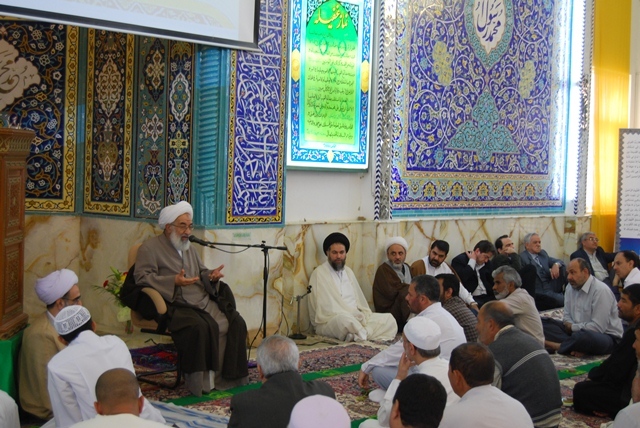 The ceremonies started on Thursday 9th Feb and continued till Saturday 11th Feb 2012 and too many people participated while Hojjat-al-Islam Rashed Yazdihas his speechon prophet’s behavior and to follow the model of his morality. On theses ceremonies groups of “Tawashih” both from Sonni brothers of Abu Dhabi and Shia brothers, Huda group sang their song and make the audience joy the celebrations. Every night, first the Maghrib & Isha prayer was helding by Hojjat-al-Islam Mahmood Madani, then recite of Quran’s verses, followed by Singing Natal poems or Tawashih and the speech of well-known speaker Hojjat-al-Islam Rashed Yazdi which made the attendants joy his speech by his nice words. During the celebrations, audience was offered sweets and at the end there were dinner reception.The presence of people in these ceremonies was eye catching. Also after Friday prayer Mr. Rashed Yazdi held his speech which prayers enjoyed of that. On 22nd of Bahman (11th Feb 2012) victory day of Islamic Revolution, Imam Hussein AS mosque held a celebration ceremony for students of Azad, Payam-e-Noor and other local universities at Iranian Club Dubai which was welcomed by students. This ceremony was started by prayer that Hojjat-al-Islam Rashed Yazdi prayed and followed by welcoming words and congratulate of the events by supreme leader’s representative. Then Mr. Rashed Yazdi had his speech and ceremony ended by lunch reception. At the night of 22nd of Bahman, Iranian Club in Dubai held a ceremony for the same subjects and Unity week. Supreme leader’s representative along with some accompany attended and audience listened to speech of Hojjat-al-Islam Rashed Yazdi. In other event, the Tawheed Boys School invited Hojjat-al-Islam Rashed Yazdi to pray Duhr and Asr Prayer by participation of students and school teachers and staff and has his speech there. After the prayer he had his advices for the students. Also on 19th of Bahman, Hojat-al-Islam Seyed Mahmood Madani and Rashed Yazdi and Babania along with some other accompany, attended on the National day of Islamic Republic of Iran in Iranian Consulate.